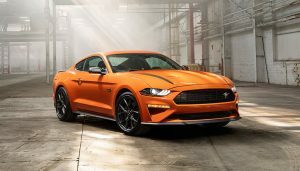 The Ford SEMA 2018 lineup includes a brace of hot pickup concepts. Here are our choices for the coolest ones of the bunch. The Detroit Auto Show might be shrinking in attendance, but it’s often still the site for automakers to unveil new models. For nearby Ford Motor Company in Dearborn, the venue is a no-brainer. 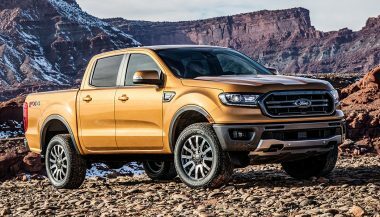 For 2018, Ford unveiled the next-generation Ford Ranger pickup that’s set to hit showrooms next year. 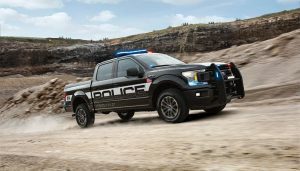 But before the first 2019 Ford Ranger has been delivered to a customer, a handful have been modified and accessorized for the 2018 Special Equipment Market Association, or SEMA, show. 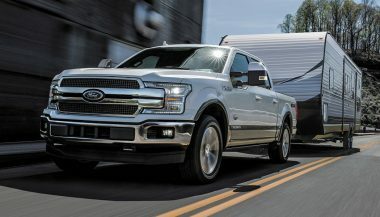 Along with the newly-unveiled 2019 Ford Ranger, Ford is bringing several variations of North America’s best-selling pickup truck, the F-150, along for the ride. Here are the best of each you’ll see from Ford SEMA 2018. 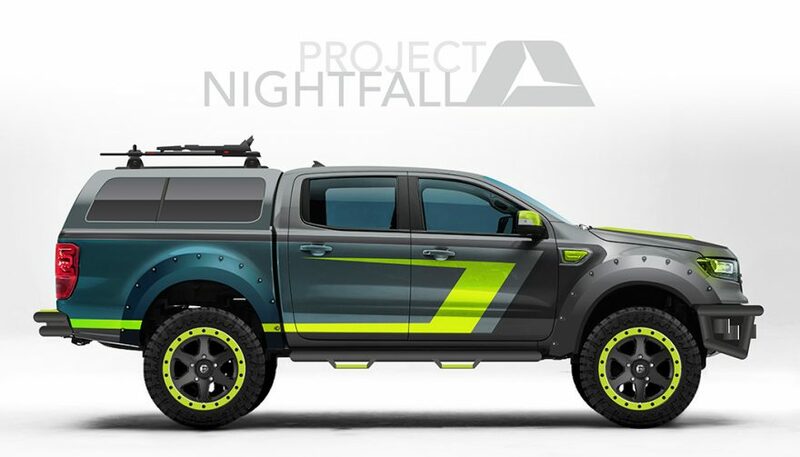 Built off a Ranger Lariat 4×4 SuperCrew with a 2.3-liter EcoBoost engine, Project Nightfall is upfitted for both off-road and urban driving. Black Rhino Mint 20-inch wheels and Airlift load lifter suspension. Plus a 3-inch FOX levelling kit with off-road shocks to add the backroad abilities. It’s finished with Axalta paint by Lynch Concepts, NFab Epyx side steps, a KICKER speaker system. It also has Alea leather inside and fancy vivid green exterior accents. In a collaboration with prolific Forza gamers AR12 Gaming, this updo is inspired by Xbox Design Lab. Of course, there are screens in the truck bed to play Xbox. And it’s wrapped in modern white and gray camo. It’s on a BDS six-inch lift with Fox coil-over suspension. 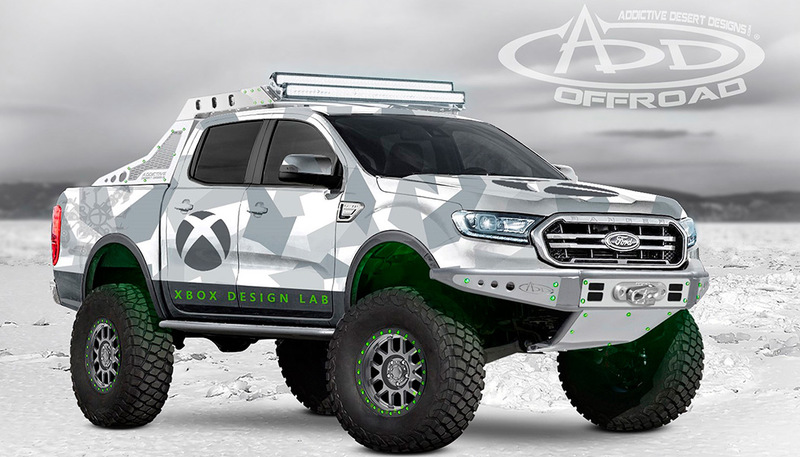 The Xbox Ranger is powered by Ford’s 2.3-liter EcoBoost engine and 10-speed transmission. Along with Borla performance exhaust to add some sound. Add-ons to this Ford 2018 SEMA show truck include a recovery strap. Plus Katzkin custom-embroidered leather upholstery, Next Base headrest screens, 42-inch HD outside screens, and the namesake Xbox consoles. Project Ranger X takes utility to a whole new level. It’s been custom converted to a long bed on a SuperCrew chassis. And it sits on – you guessed it – BDS suspension. Fox DSC coil-overs and AirLift rear airbag suspension complete the upgrades. A custom-built rack system on a Knapheide utility box is definitely unique. LED lighting, custom rock sliders and rear bumper don’t hurt either. MaxTrax MKII recovery devices and a 40-watt electric cooler are a few extras you’ll find on this SEMA truck. When you’re a racecar driver, slow isn’t an option. 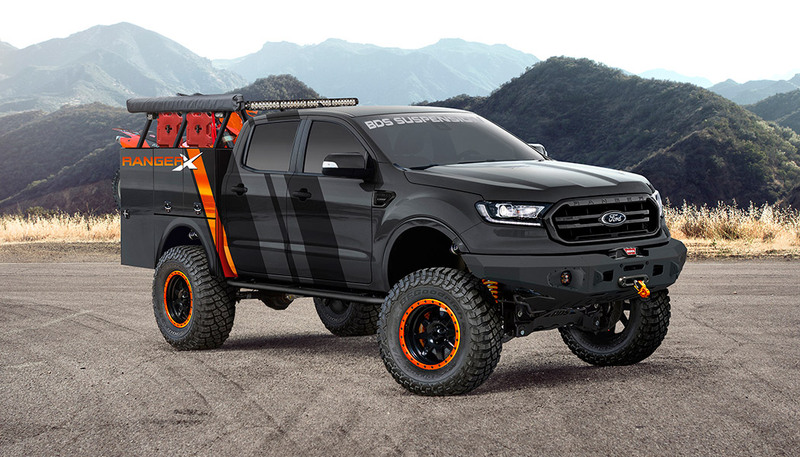 Racing legend Kurt Busch and ZB Customs collaborated on this F-150. Powered by a 5.0-liter V8 with On3 twin turbochargers and other performance upgrades to hit 1000 ponies. ZB Customs also added 4.5-inch widebody fenders, a new grille, and a carbon fiber spoiler. 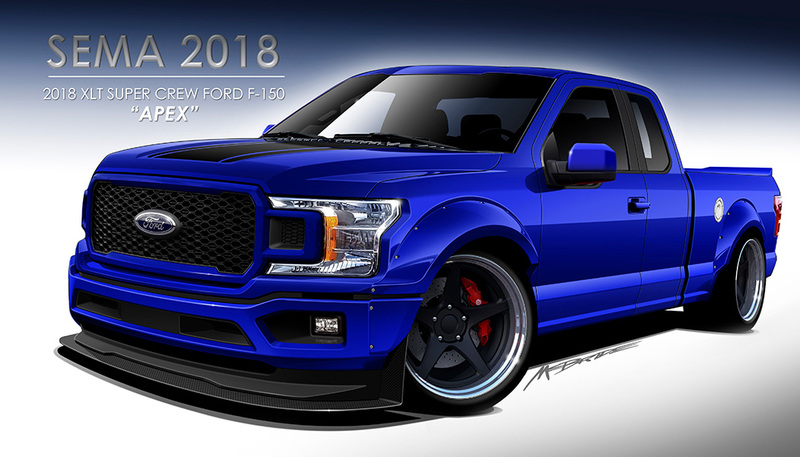 Electron Blue custom pearl ghost graphics, alligator leather seats, and more to this Ford SEMA 2018 truck. Built up by SpeedKore Performance Group and heartily endorsed by country music star Brantley Gilbert, this truck has serious eyeball. A Ford Performance supercharger is bolted on for added performance, and Brembo BM-8 big brakes bring the F-150 to a stop. 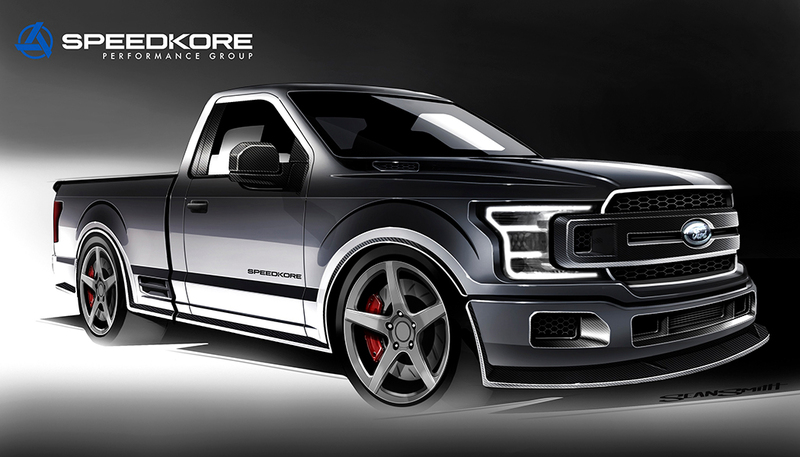 The SpeedKore F-150 is lowered three inches and rests on 22-inch HRM monoblock wheels. The kicker on this truck? A Brantley Gilbert-inspired custom guitar and amp rack to pump out the licks. Based on the 2018 F-150 Lariat 4×4 SuperCrew, this Ford SEMA 2018 concept is called “the ultimate family adventure pickup”. With the all-new 3.0-liter Power Stroke diesel engine inside and 6-inch coil-over lift and air spring kit by Hellwig Products, it’s meant to handle the toughest terrain. 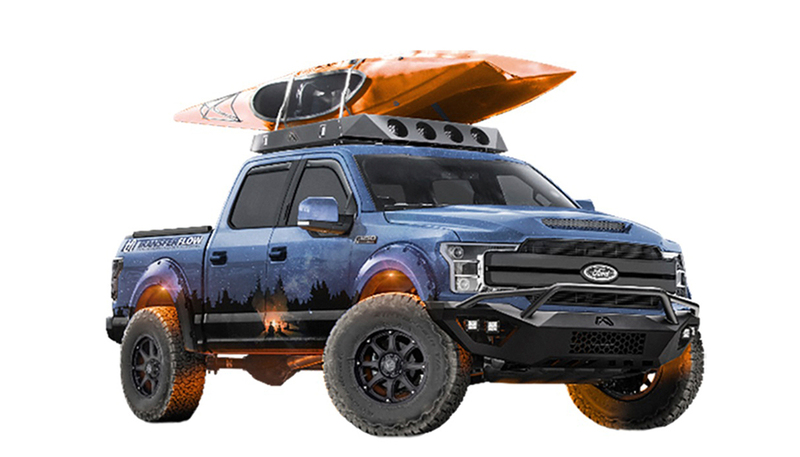 Adventure-seekers will love Bushwacker molded fender flares, a Ford Accessories kayak rack, Fab Fours Vengeance front and rear bumpers and roof rack, and RIGID underbody lighting. There’s also an in-bed 50-gallon Transfer Flow fuel tank with toolbox, and a movie projector built in. The 2018 SEMA Show kicks off October 30th and runs until November 2nd at the Las Vegas Convention Center. The Ford Ranger hasn't been produced for the North American market since 2011. 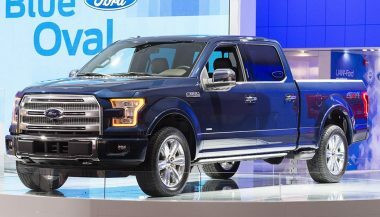 Impressed with global sales, Ford is bringing the small truck back.